WeÕre all used to everything tasting like bacon, but this candy turns your mouth into a frying pan. 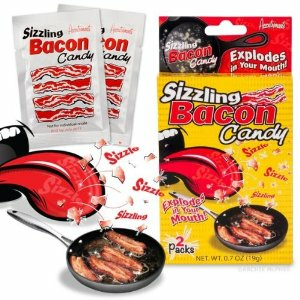 Sprinkle a generous portion of the chunks of bacon-flavored candy on your tongue and they will begin to sizzle and crack just like a slice of bacon preparing for breakfast. YouÕll get two 0.34 oz. (9.5 g) packets of carbonated candy, for a total of 0.67 oz.